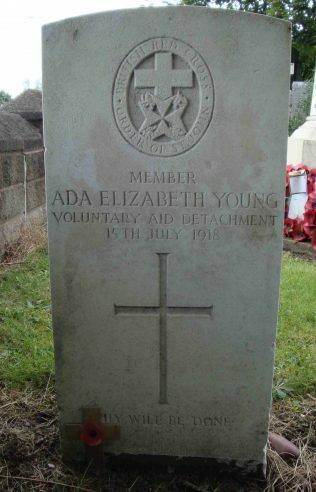 Ada Elizabeth Young enlisted as a VAD (Voluntary Aid Detachment) with the Red Cross in September 1917. 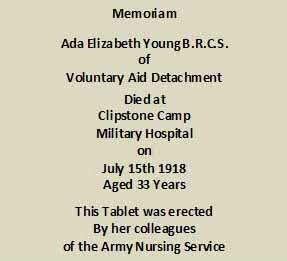 All her time nursing was spent at Clipstone Camp Military Hospital, and this is where on the 15th July 1918 she died of pneumonia, influenza and cardiac failure. She was aged 33. Three days later Ada Young was buried in the churchyard of St. Alban’s, Forest Town. She lies in a corner of St Alban’s churchyard near the main entrance. Although for the previous 10 months she had spent her time nursing and caring for sick soldiers, she wasn’t given the privilege of being buried beside the 27 other soldiers from the camp who are also buried in this churchyard, possibly because she was a VAD not a military nurse. The rows of soldiers graves are beautifully cared for by the Commonwealth War Graves Commission. Sadly Ada Elizabeth Young’s is not. At the Easter Sunday service in April 1919 a special tribute was made to Nurse Ada Young when a brass plaque was placed on the south wall inside St Alban’s Church by her nursing colleagues. The Last Post was played and the plaque unveiled in the immediate presence of Brigadier General R M Ovens (General Officer commanding the troops at Clipstone), he was accompanied by Lieut-Col Longhurst (medical officer at the camp), Rev H Bull, two lieutenants and a small company of nurses from the hospital. A detachment of soldiers from the camp were among the many people present at the service. On her death certificate Ada Elizabeth Young is listed as a nurse of 14 Adelaide Terrace, Brookfield Road, South Circular Road, Dublin. In the Commonwealth War Graves Register she is listed as ‘Daughter of Serjt. Maj. Young (5th Dragoon Guards) and Mrs Young of Dublin. She is also listed in Irelands Memorial Records 1914-18. However despite searching in a wide variety of records, to date (2013) I can find nothing more about this lady who lost her life caring for others. The above tells us of less than one year of Ada Elizabeth Young’s life - but who was she, what did she do for the first 32 years of her life, what encouraged her to become a VAD nurse and care for wounded soldiers, what did she look like? It all remains a mystery. Re the dates, well spotted Alan. For many years the memorial stone had the wrong year on 1919 as shown in the photograph. I eventually got in touch with the War Graves Commissioner about this and he got it changed to 1918, I have taken a more recent photo showing this. However as you quite rightly spotted they have not altered the day she died which was the 15th, the 17th is the day she was buried.